So today for lunch I went to the Flying Saucer with Ben. Now for those of you not "in the know," the Saucer is a bar known for two things: The vast, impressive selection of beers they stock, and the fact that their waitresses are all hot girls in schoolgirl outfits. And suddenly, paying ten bucks for two brautwursts and some fries starts to make sense. Anyway, I'm sitting there watching our waitress's plaid miniskirt wiggle away with my order and the thought hits me: I wonder what it's like to work in a place where you're routinely hit on as a matter of course. 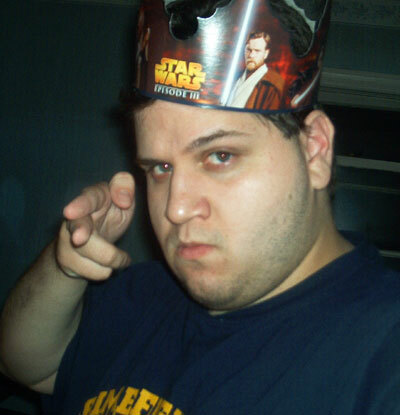 Being that in the most recent photo of me, I'm wearing a paper Star Wars crown and a Batman shirt, I'll probably never know what that's like. A LADY: So, I see you're reading the Invisibles. ME: Yeah, I'm a big Grant Morrison fan. Just got Anarchy for the Masses, so I'm re-reading. A LADY: Sounds like a good time. How about when you get off work, you come over to my place and I'll show you a hyperviral meme sigil you'll never forget? A LADY: You know you want a piece of my BARBELiTH.